The Fitbit Versa and the newer Versa Lite Edition may be a fairly straightforward smartwatches, but that doesn't mean you won't need the odd bit of guidance before you master them. And if you've just picked up either and you're wondering how to get the most out of them, you're in the right place. Here, we'll be helping you pick up the essential Versa tricks to get started with - from replying to texts to simply learning how to reset it. It's worth noting that except for some features, like offline music and swim tracking, the Versa and Versa Lite are roughly the same. So these tips work for both devices, and if they don't we'll certainly point it out. Anyway, you'll soon know these watches better than the back of your hand. Check out the tips below for all the help you need to get started. This may seem straightforward, but setting up your Fitbit Versa or Versa Lite does vary depending on whether you're trying to connect it to an iOS or Android device, or even a computer. Things can also get a little tricky if you're trying to add the Versa as a second device (tip: Fitbit doesn't allow for multiple trackers, unless it's an Aria scale) or doing so without Wi-Fi. You should automatically be prompted to set up your Versa once you've downloaded the app and followed the steps, but check out our guide on how to set up your Fitbit for more details. It's all well and good being set up with your Fitbit, but sometimes you'll need to give things a refresh if it becomes unresponsive - or, say, want to give it to someone else. This varies depending on the Fitbit device you have, but Versa users simply need to press and hold the left and bottom buttons until the Fitbit logo appears on the screen. This should take roughly 10 seconds. On the Versa Lite, you're going to have to hold down the button for 10 seconds and then the reset process will start. If that doesn't work, or you need more details, read our guide on how to reset a Fitbit. When you're collecting and syncing your Fitbit Versa data across to your phone, you want to make sure you're getting the most accurate step counts, heart data and calorie count. However, this greatly depends on your settings. To change your sleep sensitivity and stride length (to help sleep tracking and step counting accuracy, head to Account > Settings > Advanced Settings. To set your heart rate zones, head to Account > Settings > Heart Rate Zones. Even telling Fitbit which wrist your Versa sits on (Device > Wrist) is key to picking up the most accurate readings when you're out and about. If you're a swimmer, calibration becomes even more important. You'll need to calibrate your pool length to make sure you're getting the most accurate swimming data possible. Luckily, that's not too difficult to do. You just need to open up the Exercise app, then head to the swim screen and tap the cog. Then select Pool Length. Of course, you can't do this on the Versa Lite Edition. Syncing your Versa means that all the data you've collected from your wrist will be beamed to your connected phone or computer. Depending on your connected device, the process for syncing varies, with this also affected by your settings within the app - you can set your Versa to sync throughout the day in the background, or manually do so by pulling down from the home screen of the app. This should be fairly straightforward, but syncing issues with a Fitbit isn't uncommon - read our guide on syncing your Fitbit for help on what to do if your Versa isn't syncing. Once you've got to grips with the Versa and how it works on the inside, you may want to customise how it looks on the outside - after all, you probably don't want to sport that standard rubber band for every occasion. However, before you start building a collection of Fitbit Versa bands, it's important to know just how to change bands on a Fitbit. On the Versa, this involves sliding the metal pin and releasing/locking the strap in, but the difficulty of this varies greatly depending on whether your new band is metal, leather or rubber. All Versa and Versa Lite bands are interoperable. Read our guide on how to change bands on Fitbit for all the details. Again, this may seem like a straightforward tip, but it's not immediately obvious when you're first getting to know your Fitbit Versa. This actually varies quite a bit depending on which Fitbit you own, with some devices not actually able to be powered down, but the Versa's buttons allow you to save the battery for later by fully turning it off. To do so on the watch, go to Settings > About > Shutdown > Confirm Shutdown. Then, to turn the watch back on at any time, press any of the three buttons for a few seconds - you should see the Fitbit logo appearing. On the Versa Lite, you can press the single button instead, natch. This is something you're more likely to stumble across than pick up through Fitbit during setup, but getting a look at your battery life is essential for daily use. And it can be done through two ways. The simplest way to check your Versa battery is simply to swipe up and look at the top left of the screen - there should sit a battery indicator. However, it can be a little irritating to do this regularly, so it's also worth considering a Clock Face where the battery percentage featured; this way you can then simply tilt your wrist to get a look at how much juice you have left. When you're swiping up to get a look at your battery percentage, you'll also be opening up something called Quick View. This is a look at the stats you've collected that day, such as steps, your night's sleep, active minutes, calories, resting heart rate, and some historical data, including your Cardio Fitness Score, sleep history and exercise history. It's not quite as extensive as the data you'll get through the Fitbit app - where the interface is naturally easier to navigate and graphs exist for you to peruse - but it's the next best thing and handy for when you just want, well, a quick view. Unfortunately, whether you can reply to messages from the wrist depends on which device you have your Fitbit paired to. If you connect with your Fitbit through your computer or an iOS device, we're afraid that the Versa's Quick Replies aren't available for the likes of texts. However, if you're an Android user, you can text on your Fitbit. What you can and can't respond to through your pre-set replies depends on the app the notification has come from, but you can get the full lowdown in our guide to texting on your Fitbit Versa. Your Fitbit Versa is a tracking machine at heart, but this is also bolstered by the apps and customizable watch faces available to download through the Fitbit app. 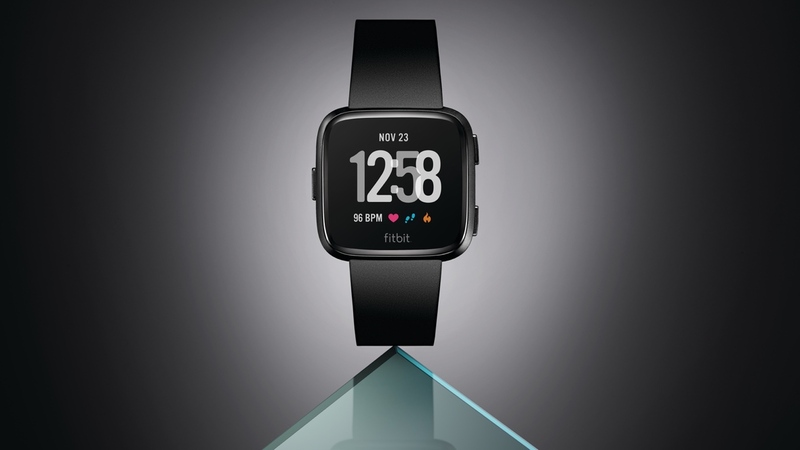 To download a new Clock Face, as Fitbit calls them, simply tap the device icon in the top left of the screen, tap Clock Faces and browse/download at will. This is a constantly updating collection, with options ranging from simplistic to data-heavy. A similar process exists for downloading an app, except you'll have to click through to Apps instead of Clock Faces. From here, you can view ones you've already got on your Versa, as well as scroll through the lists of available ones to download.